When it comes to great wealth, for 70% of families, the money is gone by the end of the second generation. 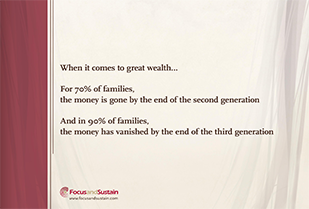 In 90% of the families, the money has vanished by the end of the third generation. Families face a real risk of becoming irrelevant and discordant within three generations. Relationships will be severed. The money will be gone. The past and all its treasures will be buried and forgotten. Even memories will fade as new generations spend their precious time scrambling to build anew. Families like yours, meticulously prepare their money for transfer to the next generation through well thought-out wills and estate planning but often do not realize they also need to prepare the family for the receipt of the money. Different generations have different views about money, based on how they perceived money growing up. For the head of the family, money may have initially been scarce, and became their main objective. For the grandchild who has received a new car for their 16th birthday, money is nothing but a tool. It is only meant to be spent. How prepared do you think your family is to steward the money? 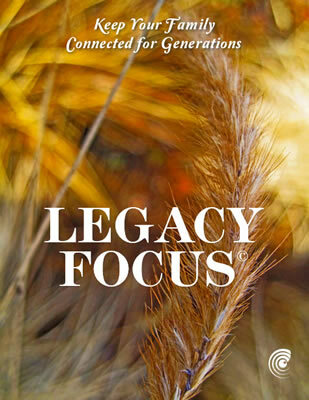 Click here to take the Legacy Focus Assessment and find out. Preparing the family starts with defining a shared meaning to the family money. But before that is done, the distinction between individual money and family money has to be clarified. Family members who understand and agree with the purpose of the family's money do not fight over the money. They already know it’s not theirs to do what they want with. The family money serves a bigger unified purpose. What individuals want outside this purpose they must finance on their own. You want your wealth to continue to benefit generations far beyond your direct reach. This is what separates legacy families from those that fade away in two or three generations. Research has shown that families who stay connected and thrive for generations also have a clear purpose for the whole family. When family members feel they are building something together, they feel they are contributing to the strong bond of the family for themselves and for future generations. Each generation has a role in keeping the purpose vibrant and relevant. When there is purpose to the family money and purpose for the family as a unit, the money stays in the family for generations. Click here to take the Legacy Focus Assessment to find out how likely is that your family will stay connected. Nobody wants their heirs squabbling over or squandering the money. Nobody wants to see their children feeling entitled to the money. You want your family to be harmonious and independent. This is what a legacy family is! Our Legacy Focus programs are designed to help you strengthen your family connection so the family continues to build on your success. We understand that your family situation is unique and may not perfectly align with the topics above. We customize our approach to meet your specific needs and objectives. In our initial conversations with you we will determine, together, what your priorities are and the best course of action to take. Your family doesn’t have to be one of the families that loses its wealth in two or three generations. Even if you think your family can’t agree on or initiate important topics, we are here to tell you that there is always something that can be done. It’s just a matter of figuring out what. We can help. You’d be surprised how even the smallest step in the right direction can make a difference in creating a great, long lasting, and deeper connection. "We’ve never had conversations like that. I’d never thought we’d all be able to agree on something. Bhaj helped us overcome a room full of strong and sometimes conflicting personalities, to start building roads for communication and understanding. When we finished, it seemed that all of the family had a new sense of closeness. It seemed that we were touching each other more, wanting to know more, and wanting to keep this process going." "Exposing G4 members to financial literacy in a fun and engaging environment was great. Everybody loved the workshop! The huge highlight is that EVERYONE wanted to continue the educational sessions for the 4th generation on an annual basis." If you haven’t done so yet, click here to take your Legacy Focus Assessment to find out what the chances are that your family will be able to grow your wealth through generations. The information you receive can assist you in tweaking or better planning for the future you want for your family. We look forward to you joining the families whose wealth, story, successes and purpose carries on through generations as a beam of light rather than a forgotten memory.